Israeli soldiers shot, on Wednesday evening, at least six young men during protests on Palestinian lands, in several parts of the Gaza Strip. 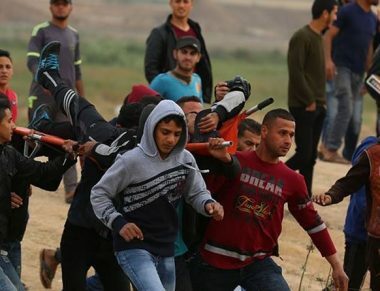 The soldiers reported to the excessive use of force against dozens of protesters east of Rafah and Khan Younis, in the southern parts of the Gaza Strip, in addition to the al-Boreij refugee camp in central Gaza, the Sheja’eyya neighborhood in Gaza city, and Jabalia, in the northern part of the coastal region. The protesters burnt tires, and raised Palestinian flags, before the soldiers started firing live rounds and dozens of gas bombs, wounding six persons, and causing many to suffer the effects of teargas inhalation. The Palestinians also organized the longest chain of reading books in Rafah, in the southern part of the Gaza Strip, as part of various activities held in the coastal region.